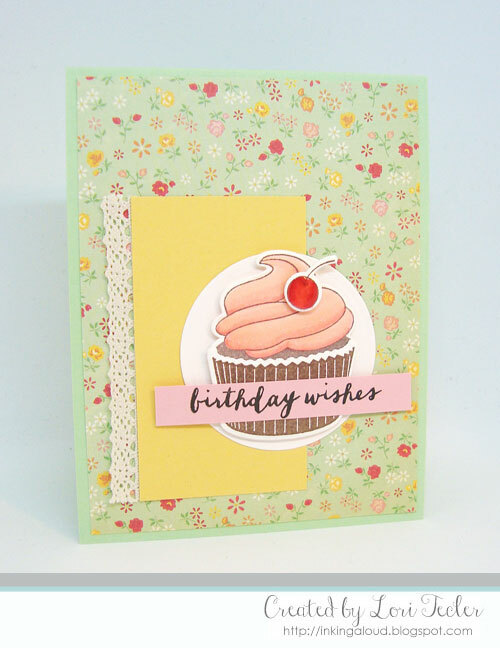 I was inspired by the pink frosting on the yummy looking cupcakes in the photo and made a cupcake the focal point of my card. The layout is from the current challenge at Sunday Stamps. 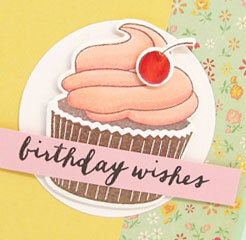 My cupcake image is from Avery Elle's Cupcakes stamp set. I stamped the images in brown ink, then added color with Copic markers before cutting out the pieces with the matching dies. The pieces were assembled on a white circle die cut, using foam tape for dimension. It's hard to see in the photo, but I gave the cherry extra shine with a coating of Glossy Accents. To go with the cupcake, I covered a mint green card base with a feminine floral patterned paper panel. After adding a lace trimmed golden yellow panel to the cardfront, I placed the cupcake image on top. I stamped the "birthday wishes" sentiment from the Red and Goldie set in black ink on a narrow pink cardstock strip. I put it in place over the cupcake with foam tape to complete the design. Super sweet take on the inspiration photo, Lori! Such a yummy cupcake! 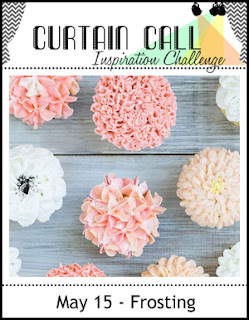 Love how you've incorporated the frosting theme and the inspiration photo in your card design.